As World War II nears its end, the small island of Hashima (nicknamed “Battleship Island”) off the coast of Nagasaki is the site of a massive coal mine where 400 Koreans lead bleak lives as conscripted laborers. Tensions run high between the Japanese soldiers who maintain order with shocking cruelty and violence, and the Koreans from all walks of life who were tricked or forced into coming there. Then, just as the island’s dark secrets are revealed, the Koreans plot a dramatic escape. When the news of the movie cast coming to Singapore to promote the movie was released, I was bombarded with messages from friends who think that I should know because of my Descendants of the Sun bridal project in 2016. I wasn’t planning to join the queue, but thanks to Clover Films, I managed to catch a glimpse of Song Joong ki, Hwang Jung-min as well as So Ji-sub. A word of advice from the cast who were here to share their thoughts about the movie, while the film aims to share a hidden piece of history, the drama and escape were designed as a movie. I was surprised to see the Train to Busan child actor Kim Soo-Ahn was one of the key actors in it. If her acting in the zombie film is a lucky break, the character Sohee definitely reaffirms her talent. If Song Joong ki and So Ji-sub are the film’s crowd-puller, it is this father-daughter pair who anchor Battleship and touches heart. The characters were weak, they weren’t heroic but they were real to me. They were the ones audience can relate to, and the love of the father, the will to survive even if means he has to please the Japanese, made as much of an impact as the heroic independence fighter (Song Joong-ki). While the storytelling was great, the strong and diverse characters who we grew to root for in the film, I was impressed how the film did not try to become a propaganda film (cough Wolf Warriers 2). It aims to evoke the right kind of empathy for the Korean characters, but did not fail to mention that many of the people, such as bandmaster LEE Gang-ok (Hwang Jung-Min) and Mallyon (Lee Jung-hyun), a lady who was forced into sexual servitude as a comfort woman, were actually tricked to the Hashima Island by their own countryman. The little plot twists along the way made the story less predictable and increased the tension of the plot. What traumatised me the most, thanks to the amazing set and realistic environment, was the hellish living condition of the conscripted laborers in a massive undersea coal mine that supports the Japanese war effort. Song Joong-ki’s role as a U.S. trained independence fighter entering the island secretly, disguised as one of the workers, to save an influential Korean leader (Lee Kyoung-young) could most probably pass off as Yoo Shi-jin’s grandfather or great-grandfather if this was a Marvel hero movie. His character felt like the extension of his character in Descendants of the Sun, and this made him a pretty cool version of Captain America Korea. That incredible escape attempt was so dramatic that it didn’t feel possible, no matter how I wish it was real. This glorious tale of evacuation and the epic climax was a magnificent piece of work which provides an imaginative insight of how the Koreans might be treated within this jail-like island. Lee Jung-hyun reduced her weight to a miniscule 36.5kg for her role in the movie and still took part in intense action sequences carrying a 5kg rifle, impressing everyone on the set with her dedication to the role. HWANG Jung-min is ranked as one of the most successful actors of recent times, thanks to a box office tear that includes ODE TO MY FATHER (14.3 million tickets) and THE WAILING (6.9 million). His films amassed a stunning total of over 50 million admissions in less than three years. Instead of using extras, Director Ryoo hired trained, professional actors for all of the 80+ figures who appear onscreen. “Each and every one of the performers contributed their own acting, so even in the mob scenes we see not conventional-looking movements, but a crowd made up of individuals each with their own distinctive actions,” he said. To recreate the island’s unique setting, production designer LEE Hwo-kyung traveled to Hashima and then performed extensive research to learn as much as possible about the actual historical location. Lee then oversaw the building of a massive outdoor set in the city of Chuncheon in Gangwon Province which involved 3 months of planning and 6 months of construction. The set included various settings within Hashima including the so-called “stairs of hell,” the mining operations, residential complexes, the comfort station etc. The measurements of the set add up to 66,000 square meters within a 132,000 square meter lot, or in other words, about 2/3 the size of the actual island of Hashima. The production of THE BATTLESHIP ISLAND, which lasted 115 shooting days over a total of 6 months, stands as one of the Korean film industry’s most complex and ambitious projects ever. 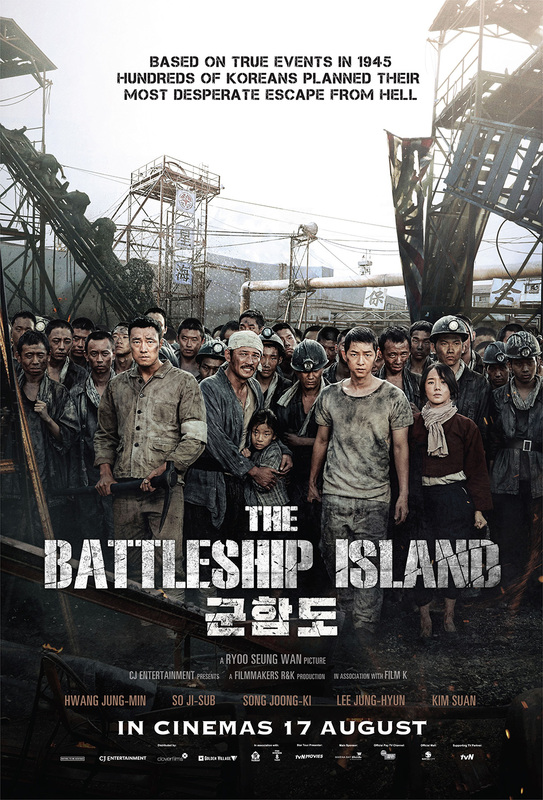 Director Ryoo Seung Wan thought of the idea of the movie after seeing a photograph of the Battleship Island, which resembles a giant prison to him. While the escape is fictional, the island exists and was inscribed as a Unesco World Heritage site in 2015. At the end of the film, a coda notes that Japan has yet to acknowledge the events that took place there, a sombre reminder that the shadows and scars of war linger on today.Unknown to many people, including Koreans like Song Joong Ki, large numbers of Koreans were brought to Hashima as forced laborers during World War II between the years of 1940 and 1945, . Young Koreans were forcibly taken as laborers under the National Mobilization Law of 1938 to address the shortage of available labor for coal mining. Koreans nicknamed Hashima “Hell Island” or “Prison Island,” and while working in mines 1,000m below the sea floor they were exposed to temperatures of 45 degrees Celsius and the danger of gas explosions. With some passages too narrow to allow one to straighten one’s back, young boys were reportedly conscripted. In such harsh conditions, the laborers were forced to work for more than 12 hours a day. Some who were not physically suited to such work ended up dying due to disease, mine accidents or malnutrition, and there were also cases of workers who fell into the water and drowned while trying to escape. A 2012 study by the Commission on Verification and Support for the Victims of Forced Mobilization under Japanese Colonialism found that among the estimated 500-800 Korean forced laborers at Hashima between 1943 and 1945, there were 134 deaths listed in official records, and the number of unreported or concealed deaths is estimated to be much higher. On July 5, 2015 a total of 23 sites in Japan, including Hashima Mine, were officially registered as UNESCO World Heritage Sites under the collective title “Sites of Japan’s Meiji Industrial Revolution: Iron and Steel, Shipbuilding and Coal Mining.” During the registration process, Japan and Korea clashed repeatedly over the issue of whether the history of forced labor should be acknowledged. Finally the Japanese government accepted UNESCO’s recommendation to “make the entire history of each site be known,” and to recognize the forced labor of Koreans in the 1940s. Under the agreement it pledged to build information centers on each site and report the results to UNESCO by December 1, 2017. However in the two years since the agreement, that pledge has not been carried out. Mitsubishi, the operator of Hashima Mine, apologized and accepted responsibility for the use of forced labor to U.S. prisoners of war and Chinese laborers, but to Koreans there have been no apologies or reparations. At present, Battleship Island is being marketed as a tourist site, a symbol of Japan’s modernization and a UNESCO World Heritage site, with its history of forced labor erased. Check out The Battleship Island 군함도 (军舰岛) Facebook Page! The Battleship Island 군함도 (军舰岛) is out in cinemas on 17 August 2017. *Disclosure: Invitation from Clover Films. No monetary compensation was received for the movie review. I’ve been looking for review for this movie, and good thing you have a very detailed blog on it. Sharing this makes my heart happy. Looks like a really interesting movie. If it ever comes to America I’ll have to check it out. How awesome that this movie is coming out. I’ve never heard of it. I haven’t heard of the bridal project neither. How awesome! What a wonderful and thorough review! I had no idea about Hashima Island. Thank you for sharing! This sounds like a gut wrenching movie. It looks very well produced and the story sounds very good. Wow that sounds like quite the movie! It sounds like a pretty intense ride that will keep you guessing! This is my kind of movie. I love to watch movies that has a good story. This looks like a great movie! I didn’t know it was based on true events! I am fond of adventurous movies in general but then any good script is worth a watch atleast once. Might watch this one too. Wow this looks like an amazing movie, but I don’t think I could watch it because it looks so sad. I am yet to watch this movie but it looks like a good watch. Thanks for sharing. This movie sounds really good! I really enjoy watching films that are based on true events. It really brings history to life! This movie sounds amazing, I would love to see it. You never really hear about what happened beyond what we were told in history books. Thank you for sharing this amazing review.